The classic Westland/AugustaWestland/Leonardo Lynx family of helicopters has always been a personal favourite of mine. I've been fortunate enough to get 'up close and personal' with a few Royal Navy ones. I know that the 'next gen' of the family, the AW159 Wildcat, is already in service in Britain and has been ordered by South Korea and (just recently) the Philippines, but does anybody know if any other countries are openly considering ordering some in the near future and what are its prospects overall in your opinion. The other two models being considered are the NH-90 and the SH-60R. I would imagine any of the current Super Lynx users are potential future customers. I just a photo of the first Philippine Navy Wildcat and learned that it's specific designation is 'Wildcat Mk220'. Any chance of the Philippines increasing their order beyond two? I just a photo of the first Philippine Navy Wildcat and learned that it's specific designation is 'Wildcat Mk220'. Any chance of the Philippines increasing their order beyond two? Both are very expensive assets and it's unlikely that the PN would add more soon as the brand-new frigates on which any new order could operate from are still quite some time away yet. Thus, it becomes a question of refurbished equipment vs new with lower spec engines...and the parts supply and aftermarket support each would get with the package price. 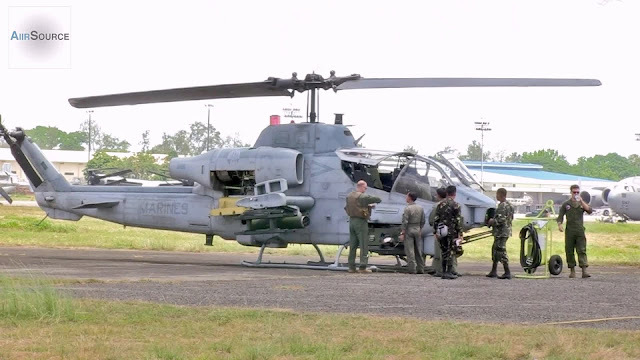 "The Philippines intend to order 8 to 10 Turkish-developed T-129 light attack helicopters, developed by TAI from the Italian Army’s Agusta A-129 Mangusta, and would thus become the second export customer after Pakistan. (TAI photo)"
BTW, I didn't realise that the T-129 had been ordered by Pakistan... Interesting.